If Russians are ignoring their upcoming presidential election, what are they talking about? This year, local issues are the hidden focus of Russia's presidential election. Photo: Emile Alain Ducke/DPA/PA Images. All rights reserved.If you follow events in Russia on the Internet, newspapers or TV, you may think that the country has been seized by the most important election campaign in a while. Russia is going to elect its president, the most influential person in the country, whose power is comparable with the Tsar’s. Surely it’s an important event, right? But in fact, while Russian public officials and politicians are ever so slightly losing their minds about thе election campaign, most ordinary people aren’t really aware of it. This is especially the case in Russia’s regions. I live in Ekaterinburg, a prominent city in the middle of Russia, located on the border of Europe and Asia. It has a population of 1.5 million, a comparatively developed economy and active media scene. But there are no serious conversations happening about the upcoming election. The winner is already known; the current president Vladimir Putin, who has ruled the country for 18 years, will triumph again on 18 March. So what is there to talk about – apart from whether Putin will receive 70% or 75% of the vote? The Kremlin’s long-term efforts to freeze political life in this country have produced the results intended. The political field around the president has been scorched clear, the parliamentary opposition is under informal control by the Kremlin, and Alexey Navalny, the only real opposition to Putin, doesn’t have access to TV, nor financial support from business. In these circumstances, the presidential campaign has become a grand simulation of an election, just like a lot of other things in Russia – from the parliament to the judicial system. For this column, I was asked to write about the election campaign as a catalyst of political processes in Russia’s regions. But I have to disappoint the editors. It’s actually the other way round – in Russia, the presidential campaign is freezing the country’s political life. There is an amusing image doing the rounds on the Russian internet: it shows a calendar that expires on 18 March, with nothing planned after election day. Indeed, it looks like the majority of officials, politicians and businessmen are limiting their planning horizons to this date. Personnel decisions, new projects and investments in the regions are postponed until an undefined “post-election” era. Since Russia’s new government will be appointed after the presidential election, some governors may be invited to take their posts in federal-level ministries and agencies. After the new ministers arrive, all the staff will be rearranged. Police chiefs, prosecutors, presidential representatives and so on are likely to be changed. In a word, the Russian establishment is facing a great change. Here it’s worth bearing in mind that in Russia, everything is decided by individuals, not organisations or institutions. One project can be supported by one official and sabotaged by another for a number of reasons, including personal ones. That’s why nobody starts any significant business before the presidential campaign – it’s usually followed by the change of officials. As far as I can tell, this campaign is viewed by most people as it should be – a kind of performance. Although candidates come to Ekaterinburg (and even attract some attention from the press), people see this as an insignificant political show. What does it matter matter what Ksenia Sobchak, Pavel Grudinin or Vladimir Zhirinovsky say when the winner is already known? Candidates are pretending to speak about local issues to try and drum up interest, but this more likely irritates people than engages them. Museum entrance at Yeltsin Center. Photo CC BY 3.0: Wikipedia.One such issue is the debate around Ekaterinburg’s Yeltsin Center, a huge modern building with a museum, art gallery, lecture halls, cinema and cafes. The Yeltsin Center, named after the Russian Federation’s first president, openly popularises liberal political ideas, standing for freedom of speech and transparent political procedures. It irritates many conservative people, especially communists, whose dislike of Boris Yeltsin dates back to 1991. Pavel Grudinin, the Communist Party candidate, says it would have been better to spend the money on a children’s hospital or something else. This point of view is shared by a lot of people, which testifies to a popular misunderstanding of the importance of investing into culture, political infrastructure and democratic institutions. Another important argument concerns plans to rename our region. During the Soviet period, our city was called Sverdlovsk after Yakov Sverdlov, one of Lenin’s closest comrades. In 1991, the city took back its historical name, but the region’s name was left the same: Sverdlovsk region. Recently, in an attempt to raise the public’s interest in a boring presidential campaign, local government decided to combine the election with a referendum on changing the region’s name to the “Ural region” after the Ural mountains. But at the last minute somebody in the Kremlin decided it was too dangerous to conduct this discussion as part of the presidential campaign. The referendum was cancelled. 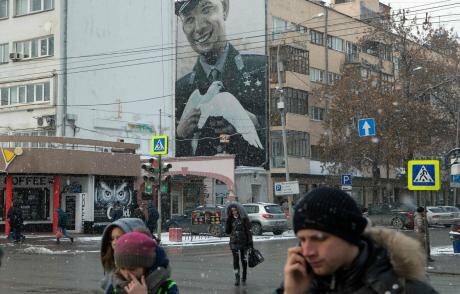 Now people are also arguing if the names of some Ekaterinburg streets should be changed. There are a lot of streets named after active members of the Bolsheviks. For instance, a fashionable street in the city centre, abundant in luxurious boutiques and trendy cafes, is named after Pavel Khokhryakov, a Russian sailor who participated in a bloody punishment campaign in Siberia in 1918. Should we keep this name and dozens of others? Some people think that renaming the streets is just a waste of time and money. Others say that symbols are important, and we should care about them. Symbols and names are especially significant in connection with the upcoming 100th anniversary of the execution of the Romanov family. Indeed, it was here in Ekaterinburg that the Bolsheviks killed Nikolay II and his family in 1918. In the 1990s, a huge church was built on the site of the execution in the centre of the city, as part of a programme by the Russian Orthodox Church to elevate the Tsar and his family to sainthood. Later, something like a cult of Russia’s “last monarch” gradually emerged – a mix of monarchism, nationalism, conspiracy theory and naive interpretations of Orthodoxy. Even the official Russian Orthodox Church is skeptical about the people who deify Nikolay Romanov, worshipping him as if he was Jesus Christ. Despite this mild official skepticism, the anniversary will be a huge religious and public event. Tens of thousands of pilgrims, in the presence of the president (Vladimir Putin, of course) and the head of the Orthodox Church, will visit the city in July. The question naturally arises: how can all these people join religious processions through streets that bear the names of the Bolsheviks who killed the Tsar? Ekaterinburg's Church of All Saints, built on the execution site of Russia's Romanov family. (c) Yaromir Romanov / Znak.com. All rights reserved.These grandiose events will be preceded by the FIFA World Cup – some of the games will take place in Ekaterinburg this summer. Preparations for the World Cup have been an important topic for the city authorities in recent years. A peculiar feature of Russia is that we upgrade our infrastructure only when preparing for some “great event” – and rarely at any other time. For decades, the city authorities have failed to improve the worn-out roads in the city centre – only the World Cup has made us do it. We’ve also built a huge stadium, though many citizens are sure this was a waste of money. After the World Cup is over, there’ll be few football fans to fill the arena. City residents are practically ignoring the upcoming election, and are concentrating on local problems instead. Over the past year, for instance, people have been protesting against the building of a new Orthodox church on Ekaterinburg’s city pond. Now the same people have united to protest against the demolition of an old TV tower, which has stood abandoned and unfinished for nearly 30 years, dominating the city’s skyline. Now the city authorities have decided to demolish it and build a new hockey arena instead. 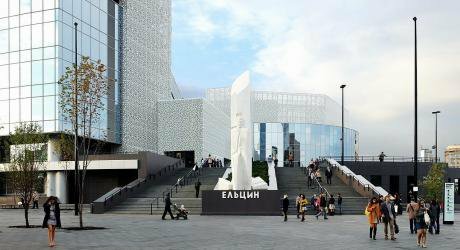 Surprisingly, a section of the Ekaterinburg public is now protesting against it. For me, I suspect it’s not the demolition that annoys people, but the fact that key decisions are made without them. 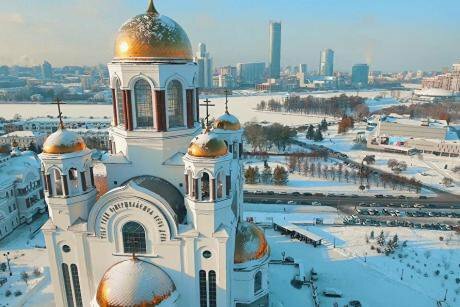 In Ekaterinburg, city residents have been speaking out against proposals to construct a new church in the centre of the city. (c) Nikolay Lebedev. All rights reserved.This is the main problem of Russia’s regions. People have hardly any opportunity to influence the authorities’ actions. Everything is decided in Moscow. The Kremlin practically appoints the governors, and the federal government allocates all the funding. Even small local issues have to be discussed with superiors in Moscow. And this is why the local authorities don’t feel any responsibility to their citizens. Who cares what people are talking about if your fate is in the hands of men in the capital? This is where the gap between the people and the authorities lies in Russia. The authorities don’t give us any opportunity to determine the fate of the country via a fair election and, in turn, people have no trust in public officials who pay little attention to their needs. In Russia, it’s a tradition that the people exist to serve the state, rather than the state exists to serve the people. This is why the demand for change is barely noticeable – and why we’re not discussing the presidential election. We don’t feel that we’re involved in the way decisions are made. But I hope (and believe) that we’re gradually moving forward, to a more demanding and responsible society.